A "markup" is the difference between what a product or service costs you to produce and the price at which you ultimately sell it to consumers. It's usually expressed as a percentage, and it's an important number. Markup represents your company's gross profit margin, so it's critical to understand and consider all the costs, material, labor, and overhead, both direct and indirect, that go into its calculation. It's is used by manufacturers, wholesalers, and retailers alike. The markup must be sufficient to keep your business profitable, but realistic enough to open the door to increased sales and market share expansion. Establishing markup is one of the most important parts of pricing strategy particularly when you're starting a new business. 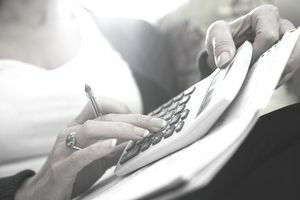 Markups must be sizable enough to cover all your anticipated business expenses, as well as reductions like markdowns, stock shortages, and employee and customer discounts. Yet they must still provide the business with a good profit. The acceptable range of markups can be different from industry to industry because they're based in part on what customers are willing to spend. This, in turn, is influenced by the industry. The pricing strategies of your competitors can also play an important role. For example, small appliance manufacturers can sometimes assign markups of 30 percent or more, while clothing is often marked up by as much as 100 percent. Even within industries, markups can vary. The automotive industry is usually limited to a 5 to 10 percent markup on most new cars, but sports utility vehicles might enjoy markups as high as 25 percent or more. Anticipated sales volume is a significant factor in markup as well. High volume goods can use a lower markup and still generate the required level of profit. As volume increases, unit costs might come down. The strength of your brand is also a factor. A strong brand can command a higher price and a higher markup even though its cost might be more substantial. This is a critical component that cannot be overlooked or under-emphasized. It costs you money to keep your doors open for business. You have insurance costs, and you have rent or mortgage bills to pay. You must compensate your employees. You need supplies. All these things factor into markup because your sales price must be sufficient to cover them as well as your costs in the product itself and still leave surplus for a profit. But here's where it gets tricky. You can't calculate using all your total overhead, but rather you would use a percentage dedicated to the particular product on which you want to determine markup. This is referred to as allocating your overhead and it can be difficult to figure out. If you allocate too little, you'll lose money. If you allocate too much, you could lose customers who simply won't pay your high prices. You might seek the help of a financial professional for this if accounting isn't your strongest suit. If you have a product that costs $15 to buy or make, you can calculate the dollar markup on selling price this way: Cost + Markup = Selling price. If it cost you $15 to manufacture or stock the item and you want to include a $5 markup, you must sell the item for $20. And remember that the $15 cost must include your allocated overhead. If you neglected to factor that in but it should have been $4 based on that product's share of your overall overhead, the equation now looks like this: Your cost is $19 so now you must sell the item for $24 if you want to include a $5 markup. This can leave you in an untenable position. If the store down the street is selling the same item for $15, consumers will buy it there and you'll lose money. That particular item might sight on your shelves, unsold and not selling, for months on end. The only way to remedy this is to reduce your markup to meet your competitor's price...or tweak your costs to reduce them. You can also switch around the equation to calculate markup: Selling price - Cost = Markup. If the sales price of an item is $15 and it cost you $10 to manufacture or stock it, your markup is $5. If selling price equals 100 percent, you can calculate what percentage of that 100 percent is represented by the cost and what percentage is represented by markup. In this case, the calculation would be $5 divided by $15 = 33.33 percent.